The manager has downplayed speculation surrounding the striker’s future, saying the Reds need the depth up top. 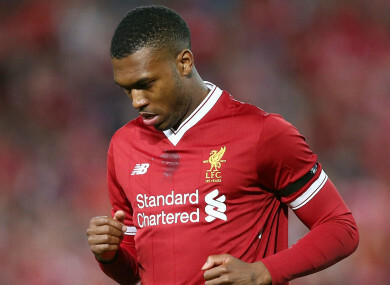 LIVERPOOL MANAGER Jurgen Klopp urged Daniel Sturridge to stay focused despite speculation about his future, saying the Reds still need the England striker. Sturridge has made just four Premier League starts this season and another four off the bench, scoring twice. The England international is likely to need more game time if he is to make Gareth Southgate’s World Cup squad, but Klopp — whose side visit Sevilla in the Champions League on — said he wanted Sturridge focused on Liverpool. “I can imagine a player with his quality is not happy that he is not starting all the time, but that’s all,” he said. Sturridge made 26 starts and scored 21 league goals in 2013-14, but has since netted 17 league goals in 29 starts in three-plus seasons while often struggling with injuries. This season, the forward has been unable to unseat Jurgen Klopp’s first-choice forward trio of Mohamed Salah, Roberto Firmino and Sadio Mane. Email “Klopp: Sturridge is needed at Liverpool”. Feedback on “Klopp: Sturridge is needed at Liverpool”.